Earlier today, WhatsApp introduced video calling in WhatsApp messenger’s beta app for Android. Now, WhatsApp users can make video calls to other users. 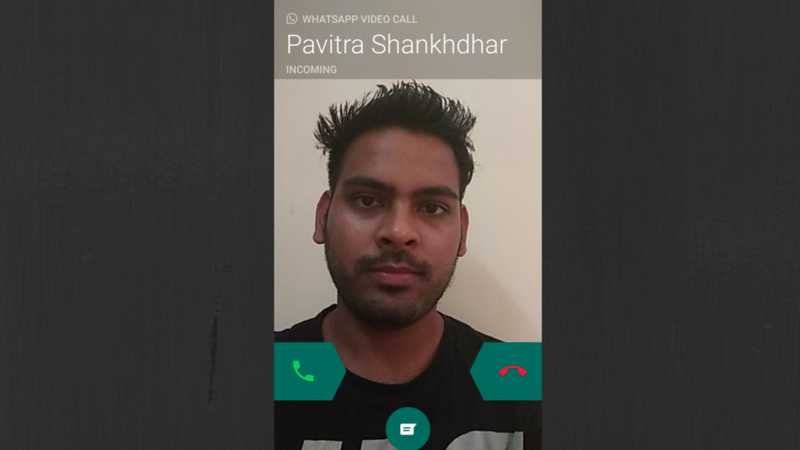 Video calling was a long-awaited feature of WhatsApp and we can expect this feature to go live soon in next update. As the feature is not yet available, you will not see video calling option. If you do not wait for the official update, you can download the beta app now. Use this link. Download the beta app from the above link and install in your android phone. Once you have installed the WhatsApp app version with video calling installed, you only need to open the conversation and tap on call icon. When you tap on call icon, it will ask you to select from video call or audio call. Tap on video call to make video call. Video call on WhatsApp work pretty good. While you are on call, you have option to select camera view or mute the mic. In call logs section, you can differentiate between audio call or video call just by looking at icons. In case other person fails to receive your call, you can send a voice message. As of now, this feature is working if both persons involved in video calling have the latest beta version of the app installed. Beta version of the app is for testers and after successfully testing this feature, the company will push this feature to live app. Once the feature is available in live app, you will get the update from play store. Until the update comes, you can install the beta app from the link given above. Try WhatsApp video calls and if you fae any issue, do not forget to leave the comments.